Blue Earth-based large structural and custom metal products fabricator has high standards. 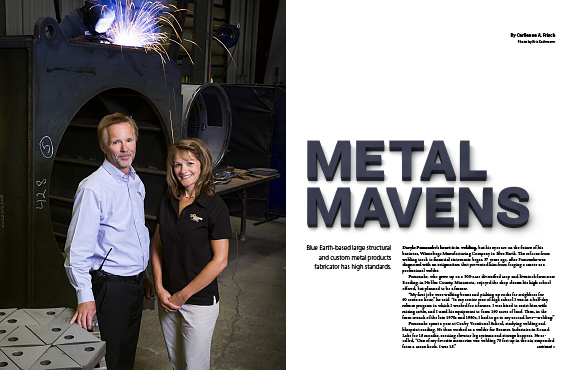 Daryle Pomranke’s heart is in welding, but his eyes are on the future of his business, Winnebago Manufacturing Company in Blue Earth. The refocus from welding torch to financial statements began 37 years ago, after Pomranke was diagnosed with an astigmatism that prevented him from forging a career as a professional welder. Pomranke, who grew up on a 300-acre diversified crop and livestock farm near Reading, in Nobles County, Minnesota, enjoyed the shop classes his high school offered, but planned to be a farmer. Then the light went out on Pomranke’s welding career. He began having issues with his vision: an optometrist said his astigmatism would only get worse. So on the advice of a brother, he enrolled in the two-year accounting program at the vocational school in North Mankato, now South Central College. During this time, he worked at Carlson Craft, churning out wedding invitations on a Heidelberg press. He also became acquainted with another accounting student, Connie, whom he married in April 1981. After graduating, Pomranke spent the next 11 years crunching numbers for three different employers. He spent his next 11 years at North Star Concrete, a then locally-owned company through which he advanced to the operation manager’s position. When the company was sold to a Texas corporation in 1998, he applied for the general manager’s position at Winnebago Manufacturing and interviewed with Lyle Jacobson and Tom Richards, who were in charge. Pomranke recalled, “After I passed the first interview, Lyle and Tom asked about my personal finances. I said, ‘Are we talking about the job now, or are we talking about buying the company?’” The response was a buy-out offer. Over the next couple of weeks, the company’s general manager, Bob Preston, asked Pomranke if he would share in the deal, and another business acquaintance of Pomranke’s agreed to become a silent partner. So the deal was made. Pomranke continued in his job at North Star Concrete while the trio spent the next year arranging SBA, bank, and personal loans. They completed the purchase in May 1999, with Pomranke taking the president’s position, and Preston acting as vice president and sales manager. They bought out the silent partner in 2004. Pomranke bought Preston’s shares two years ago and now co-owns the company with Connie. As a subcontractor for a Twin Cities company, Winnebago Manufacturing had its largest project to date—construction of entire feed mill structures that were shipped to China. The company website lists these services: welding, rolling (making a flat sheet of steel into a cylinder or other shape), torching, shearing, forming, and sawing. In 2011, Winnebago Manufacturing achieved ISO 9001:2008 status, a nationally recognized system of quality standard, audited annually by International Standards Organization. Certification ensures services and products are safe, reliable, and of good quality, and provides opportunities for the company to enter new markets and opportunities to apply strategic planning in use of machinery. A walk through the shop, while wearing the requisite safety glasses, takes a visitor past computerized machines, such as the torching machine that runs on tracks, and offers a view of the manufacturing process of the huge frames that will hold generators for ships, oil rigs, and mining haul trucks. In another part of the shop, workers form cylinders destined for assembly into massive clothes dryers with 550-850 pound capacity that will be used on ships, by uniform companies, and in hotels. Pomranke no longer crunches numbers on a daily basis, having passed along the financial responsibilities to office manager Janet Hassing. His main focus is driving the growth of the company, which provides endless variety in his daily schedule. Matt, who has a two-year vocational school degree in air conditioning and heating as well as an accounting education, worked as a fabricator for Minnesota Elevator for seven years. After welding and fabricating at Winnebago Manufacturing three years, he has overseen part of the production area, worked as the plant manager, and spent time in the office. As general manager, he now oversees purchasing. Connie handles the employee handbook, website updates, obtaining advertising and promotional items such as umbrellas and coolers, and staying abreast of state and federal requirements on such issues as storm water permits and core sampling. She makes herself visible in the plant by detailing the employee water fountains and restrooms, although they are maintained by a cleaning service. Connie added, “I don’t put myself above other employees. As the second oldest child in a family of nine, I grew up taking care of people. I did cooking and housework. I was babysitting at 11, and at 16 was a nurse assistant in a nursing home, my most rewarding job to this day.” Her quintessential role with Winnebago Manufacturing, however, has been as a sounding board throughout years of dinner table conversations. Another source of varied business perspectives is a peer council arranged by Enterprise Minnesota, which sponsors a half-day meeting every month in Owatonna. Professional speakers discuss a variety of topics such as insurance, company succession planning, tax credits, the background to look for in hiring a new president, things to consider in building expansion, how to implement proper procedures in hiring and terminating employees, selling the business, etc. One aspect Pomranke is seriously considering is the $1 million purchase of two pieces of equipment next year: a stress-relief oven and a shot blast system. These will provide options for new business opportunities. His vision of the future continues to be bright. In 1950, Fred Hicks opened Hicks Repair, a farm repair and blacksmith shop on US 169 in Winnebago. The shop was bought seven years later by three Mankato businessmen: Cecil Jones, the founder of Mankato manufacturing companies Jones Metal Products, Kato Engineering, KatoLight Corporation and Ka-Win; and Ray Stifimer and Al Thisius. With the new name of Winnebago Manufacturing, the company did OEM (original equipment manufacturing) work for Jones’ companies in addition to continuing with farm repair jobs. In 1986, Jones’s sons-in-law, Tom Richards and Lyle Jacobson, took over the company, while continuing to manage Jones Metal Products and KatoLight, respectively. The following year, Winnebago Manufacturing moved to its present location, a 58,944 square foot building in the West Industrial Park in Blue Earth. Winnebago Manufacturing is a member of the Blue Earth Chamber of Commerce. The Pomrankes take part in economic development associations, where discussions vary from road sign improvement to grants for new hires. Pomranke has served 20 years in his church council finance office. Family? Two sons: Matt, and his two children; Corey (a chiropractor) and his wife. return to learn extra of your useful information. Thank you for the post. I will certainly return. Very informative post. Thank you very much for sharing.